Exclusive to Best Buy, Fallout 4 Gold Edition. 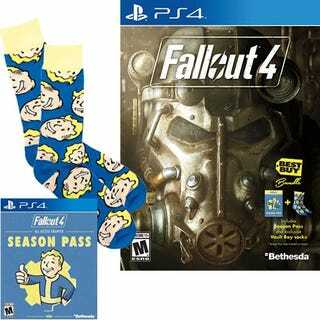 The Gold Edition contains Fallout 4 ($60), Season Pass ($30), and Vault Boy Socks ( $5??). It’s 84.99 without GCU, giving you a saving of $5 at least, with a sock to keep you warm. However, if you have GCU, this is a damn good price for Day 1 since normally, a Season Pass do not receive a discount under normal ordering condition. This gives you a saving of $11, and a sock. Also, all Fallout 4 preorders receive a $10 gift card as a Reward Certificate (better than a regular gift card since it deducts from the price pre-tax).